Among the 1.2 million American citizens living in mountaintop removal mining counties in central Appalachia, an additional 60,000 cases of cancer are directly linked to the federally sanctioned strip-mining practice. Scotland Yard says it has arrested the "spokesman" for the hacking groups Anonymous and LulzSec. Hacker aus dem Umfeld von Anonymous haben die Veröffentlichung von über acht Gigabyte geheimer Daten der italienischen Internetpolizei Cnaipic angekündigt. Sie wollen die "korrupten" Machenschaften der Behörde anprangern - und sich für die Festnahmen der letzten Woche rächen. The U.S. House of Representatives is currently considering H.R. 1981, a bill that would order all of our online service providers to keep new logs about our online activities, logs to help the government identify the web sites we visit and the content we post online. This sweeping new "mandatory data retention" proposal treats every Internet user like a potential criminal and represents a clear and present danger to the online free speech and privacy rights of millions of innocent Americans. With a new anti-wolf governor in New Mexico, the U.S. Fish and Wildlife Service is under pressure to resume trapping and shooting Mexican gray wolves -- even though only about 50 wolves survive in the wilds of Arizona and New Mexico. In 2008, the Fish and Wildlife Service wisely, but belatedly, suspended trapping and shooting of wolves. Before that, many wolves had been killed or lost limbs to agonizing traps. The wolves have barely recovered since, and now they're counting on you to help defend them against a return to inhumane persecution. Please write your congresspeople and Interior Secretary Ken Salazar today and urge them not to revert to trapping and shooting Mexican wolves. Visit http://action.biologicaldiversity.org/p/dia/action/public/?action_KEY=7420 to take action now. How's the weather by you? I just can't stand this heat anymore! I recently read that climate science has shown that global warming is contributing to the changes in weather and temperatures that we're experiencing. But you wouldn't know that if you were watching FOX News. FOX News has not mentioned human-induced climate change or global warming while reporting on or discussing the current heat wave at all! Apparently FOX News only discusses global warming when it helps to advance their agenda--for instance, they used the February 2010 blizzards to mock global warming. Well, I'm turning the heat up on FOX News--I just sent them a message telling them to stop promoting an anti-climate agenda and start providing accurate coverage of the climate crisis. Ein Gigabyte interner Daten: Unbekannte aus dem Umfeld von Anonymous behaupten, massenweise vertrauliche Nato-Dokumente zu besitzen. Sie haben angebliche Beweisstücke ins Web gestellt - und drohen mit weiteren Veröffentlichungen. LONDON—A group of computer hackers claims to have breached NATO security and accessed hordes of restricted material. The group called Anonymous says it would be "irresponsible" to publish most of the material it stole from NATO but that it is sitting on about 1 gigabyte of data. Anonymous posted a PDF file Thursday on its Twitter page showing what appeared to be a document headed "NATO Restricted." Once more, your voice is urgently needed to help save America's most endangered species. Just days after the Center and U.S. Fish and Wildlife Service finalized a historic agreement to speed protections for 757 species, House Republicans have placed a rider in the appropriations bill for funding the Department of the Interior that would prohibit the government from spending any money to list new species as endangered or designate their habitat critical. Dubbed the "extinction rider," the bill would handcuff the Endangered Species Act and place hundreds of species at greater risk of extinction. Please contact your U.S. congressional representative and urge him or her to oppose the extinction rider. Visit http://action.biologicaldiversity.org/p/dia/action/public/?action_KEY=7368 to take action now. Das FBI geht massiv gegen die Hackergruppe Anonymous vor, in mehreren US-Bundesstaaten wurden Dutzende Razzien durchgeführt. Der Behörde zufolge nahmen die Beamten 14 Personen fest - sie sollen hinter einem Online-Angriff auf den Bezahldienst PayPal stecken. Selon les autorités américaines, seize personnes ont été arrêtées aux Etats-Unis, et cinq autres en Grande-Bretagne et aux Pays-Bas. A day after the online sect LulzSecurity pulled their own hack on Rupert Murdoch, members of the most the widely-known hacking collective Anonymous, from which LulzSec spun off, have been raided by the FBI. I just signed Bernie's Petition! I just received this shocking email from the civil liberties activism group Demand Progress. Shocking news: Moments ago former Demand Progress Executive Director Aaron Swartz was indicted by the US government. As best as we can tell, he is being charged with allegedly downloading too many journal articles from the Web. The government contends that downloading so many journal articles constitutes felony computer hacking and should be punished with time in prison. We disagree. Will you click here to show your support for Aaron? The charges are made all the more senseless by the fact that the alleged victim has settled any claims against Aaron, explained they've suffered no loss or damage, and asked the government not to prosecute. James Jacobs, the Government Documents Librarian at Stanford University -- where Aaron did undergraduate work -- denounced the arrest: "Aaron's prosecution undermines academic inquiry and democratic principles," Jacobs said. "It's incredible that the government would try to lock someone up for allegedly looking up articles at a library." Amazing news! Rep. Barney Frank just introduced a bill that would legalize marijuana at the federal level. But the fate of the bill hinges on our ability to convince Congress that legalization is the will of the people. We must show our legislators that this bill has massive public support. I just sent a message to my representative. Will you please join me in urging your representative to support Rep. Frank's marijuana legalization bill? If passed, this bill will end marijuana prohibition for adults. But we need to get the legislative process moving immediately. Ask your representative to support Rep. Frank's marijuana bill today. If passed, the bill will end the federal war on marijuana, making it legal like alcohol and tobacco, and allow states to decide their own marijuana laws, free from federal intervention. Change is clearly in the air if we can seize the opportunity. There is no time to waste - urge your representative to support this powerful bill today! Then please spread the word! http://dpa.convio.net/site/Advocacy?s_oo=xmUAFhSu1UdzuvjPHMjdDg..&id=711 If the text above does not appear as a link or it wraps across multiple lines, then copy and paste it into the address area of your browser. Facebook soll an einer besseren Integration von Nachrichten arbeiten, Anonymous will ein eigenes, natürlich anonymes soziales Netzwerk starten, und Anzeigen, die für Google+ werben, sind bei der Konkurrenz unerwünscht. Le collectif de pirates informatiques s'est attaqué, la semaine dernière, au géant de l'agroalimentaire Monsanto, décrié pour sa production et commercialisation d'OGM et son herbicide toxique, le Roundup. Chat transcripts by Bradley Manning, the alleged source of secret US government documents for WikiLeaks, will be used as evidence in his military trial. They reveal a conflicted and lonely young soldier who felt strongly about revealing "almost criminal" behavior. He's spent 14 months in jail, but there is still no date for his trial. Have you heard about fracking? Fracking is a federally unregulated extraction process used in many natural gas drilling sites. The process can contaminate drinking water supplies with cancer-causing chemicals and significantly deplete freshwater aquifers. The process is exempt from no less than seven major federal environmental laws - leaving federal agencies hamstrung in their efforts to protect families, communities and ecosystems from the potential dangers of fracking. Please, join me in signing on to Public Citizen's recommendations to the Department of Energy. Please use the link below to take action to help protect endangered Kemp's ridley sea turtles from speeding motorists allowed to drive their vehicles on Texas nesting beaches. I really care about protecting sea turtles from being pushed to extinction, and hope you join my efforts and the Sea Turtle Restoration Project right now. I just took action with Oxfam America to tell the American Petroleum Institute to stop fighting a law that would mean local communities knew what was going on in their backyards. We need intense pressure from the public to make sure the API hears us. Can you take two minutes to raise your voice too? http://act.oxfamamerica.org/site/Advocacy?s_oo=E14UqOdhy-62vnY8k1NBvQ..&i... If the text above does not appear as a link or it wraps across multiple lines, then copy and paste it into the address area of your browser. Pesticide contamination of our waterways and water supply causes significant, unnecessary threats to wildlife and human health. Yet the Environmental Protection Agency is poised to authorize the broad-scale application of pesticides into the nation's wetlands and waterways. Please tell the agency that our wildlife and waterways deserve stronger protections. Visit http://action.biologicaldiversity.org/p/dia/action/public/?action_KEY=7296 to take action now. Tell Congress: Investigate News Corporation! Family members of 9/11 victims just called for an investigation into allegations that FOX News owner Rupert Murdoch's newspaper News of the World sought to hack into voicemail boxes of 9/11 victims. Murdoch has already been forced to shut down the British paper since it has been revealed that its reporters hacked into the voicemail of politicians, celebrities, British soldiers and even a missing girl who was later found murdered. But now this scandal has expanded to the US, on reports earlier this week that a former New York City police officer claims he was offered money by News of the World journalists to retrieve phone records of 9/11 victims and their families. This is an opportunity to hold the owner of FOX News accountable before the American people for the detestable practices he promotes as journalism. Murdoch's News Corporation is a US company that operates FOX News, The Wall Street Journal and The New York Post. And if any News Corporation outlets were spying on Americans, we deserve to know. Newly emboldened by the U.S. Supreme Court's disastrous ruling in Citizens United v. FEC, corporate CEOs will be spending unprecedented millions to influence elections in 2012. But shareholders – not the CEO and not the board of directors – are the REAL owners of any publicly traded corporation. And shareholders should be able to stop the flood of corporate money. Last week, Sen. Mikulski co-sponsored the bill to ban genetically engineered salmon. This is a great victory for all of us working to stop GE salmon from reaching our families' dinner tables. Help me thank Sen. Mikulski! Die US-Beraterfirma Booz Allen Hamilton hat offenbar ein Datenleck: Die Web-Guerilla Anonymous will Zehntausende militärische Zugangsdaten veröffentlicht haben. Dabei soll es sich um Passwörter und E-Mail-Adressen handeln, viele gehören zum US-Militär. Das Pentagon ist alarmiert. La Haute Cour de Londres entame mardi l'examen de l'appel de Julian Assange, fondateur de WikiLeaks, contre son extradition vers la Suède, où deux ex-collaboratrices l'accusent d'agressions sexuelles. 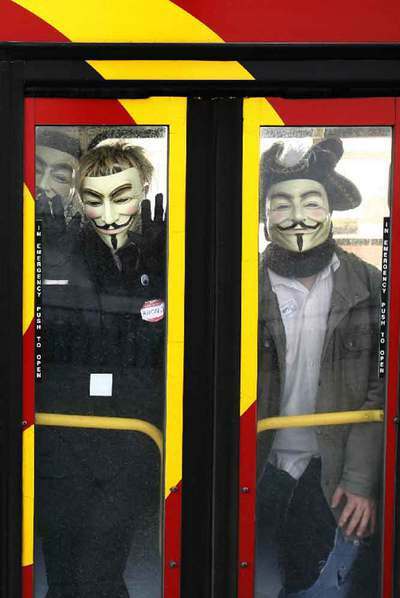 Anonymous regresa en defensa de Assange. Varios miembros destacados del colectivo han amenazado con lanzar ataques contra la policía y la justicia británicas mañana, día en que la extradición de Julian Assange vuelve a ponerse en juego. El editor australiano comparece ante el Tribunal Superior de Londres, donde se verá el recurso que plantearon sus abogados para evitar que sea llevado ante la justicia sueca. The numbers are staggering: tar sands mining in Canada's Boreal forest could claim the lives of 160 million migratory birds -- including millions of backyard songbirds we love seeing and hearing every summer. Now, the oil giants want a new tar sands pipeline that would drive even more destruction of the Boreal and its songbird nursery -- unless we mobilize swiftly to stop it. Please send a message of protest to Secretary of State Hillary Clinton, who will soon determine whether this cross-border project is in America's national interest. She needs to hear from you immediately. Her department is rushing headlong toward approval of this environmental fiasco. The Keystone XL pipeline would transport raw, toxic tar sands oil 2,000 miles -- from Alberta, Canada to refineries in Texas -- threatening fresh water for millions of American families. Its sister pipeline -- the Keystone One -- has already ruptured 12 times in its first year of operation! The Keystone XL will double tar sands consumption in America, thereby doubling the devastation of Canada's Boreal forest and its songbird nursery. Four out of ten 'backyard birds' in America migrate to the Boreal to nest and rear their young. Where will those birds nest if their ancient forest home is obliterated to produce the world's dirtiest oil? Barrel for barrel, the production of tar sands oil spews three times more global warming pollution than producing conventional oil. And transporting more of it to the U.S. won't even lower our gas prices; it will actually increase gas prices in the Midwest! It's a plan only the oil industry could love, and only citizens can stop! It's critical that hundreds of thousands of Americans direct their outrage at the State Department, which has never delivered the hard-hitting environmental review of the pipeline that Secretary of State Clinton promised. It's beginning to look like 'the fix is in' and that Big Oil's interests will once again prevail over everyone else's unless there is a national outpouring of protest. The tar sands pipeline will destroy the Boreal, decimate songbird populations, turbo-charge global warming, raise gas prices and threaten to poison America's drinking water supplies. Tell Secretary Clinton you're not willing to pay the high price for more tar sands oil! P.S. After you send your message to Secretary Clinton, you'll have the opportunity to forward my message to people you know who should be alerted to this issue. Please be sure to help spread the word. Time is short. We can only stop the pipeline -- and save millions of songbirds -- if each of us helps mobilize a national outpouring of protest by reaching out to one or two other people. http://www.nrdconline.org/site/Advocacy?s_oo=I0EZZHiRaGAsjzHIPqMuCw..&id=... If the text above does not appear as a link or it wraps across multiple lines, then copy and paste it into the address area of your browser. Picture this. Pacific Rim, a multinational corporation, wants to mine for gold in El Salvador using dangerous chemicals that would threaten the water supply of poor communities. Communities fight back -- despite intimidation and even murder of local activists -- and win new mining safeguards from their government. In retaliation, Pacific Rim sues the Salvadoran government through an international tribunal, demanding millions of dollars in compensation. This frightening true story was made possible by a free trade agreement that El Salvador signed in 2005 with the United States and neighboring countries. Right now, Congress is preparing to vote on three nearly identical agreements with South Korea, Colombia and Panama. Each would empower multinational investors to pursue quick profits at the expense of human rights, environmental protections, and sustainable development. For instance, in Colombia, the deal would encourage investments in destructive mining, oil drilling, and industrial palm oil plantations, which could displace indigenous peoples. All three agreements would give companies the right to sue for compensation for complying with health and environmental regulations. This is unacceptable -- and there's time to stop these deals, so please join me in taking action today. The following is a response to last week's New York Magazine article, Bradley Manning's Army of One. With news of yet another pipeline burst, it's long past time for the Obama administration to say no the Keystone XL Pipeline. Last week, an Exxon pipeline spilled up to 42,000 gallons of crude oil into Montana's Yellowstone River, threatening wildlife and the surrounding community. The Yellowstone River is home to numerous species of fish, including native pallid sturgeon, downstream from the spill. Spawning season means that there are fish eggs and recently hatched fish in the river's channels. Nonetheless, President Obama and the U.S. State Department are still considering approving TransCanada's plans to build yet another massive oil pipeline. The Keystone XL pipeline would span nearly 2,000 miles and transport one of the world's dirtiest fossil fuels: tar sands oil. Just the method of extracting oil from tar sands can devastate Canada's boreal forest and wetlands that serve as breeding grounds for migratory birds. A spill along the route could threaten water supplies, wildlife and public health. The world's leading climate scientists warn we cannot burn enormously greenhouse-gas-intensive tar sands oil and maintain a safe climate. Tell the Obama government that it's long past time to put a stop to the Keystone XL project and begin the transition to a clean-energy future. Visit http://action.biologicaldiversity.org/p/dia/action/public/?action_KEY=7245 to take action now. I have been reading Ellington Darden's Bowflex book, sort of following his plan. Is anyone else getting far better results than he predicts? I told my Representative to end the wars, bring the troops home! Did you know that according to a new report, the final bill for U.S. wars could be more than $4 trillion? This week, the U.S. House of Representatives will start considering several key amendments to the military funding bill. These amendments will help bring the many U.S. wars to an end.